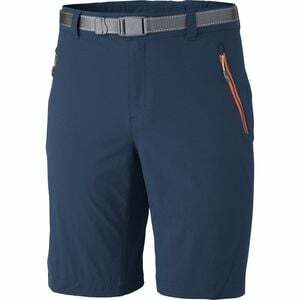 Columbia made the Men's Titan Peak Shorts with serious hikers, climbers, and adventurers in mind. Crafted from modern Omni-Shield fabric with bonded seams and four-way stretch technology, these shorts effortlessly keep up with any rigorous outdoor activity and feel incredibly comfortable. Even when you hike under the blazing summer sun, their Omni-Shade UPF-rated 50 protection shields you from harmful rays while the integrated and removable belt holds the shorts in place. A gusseted crotch and partial elastic waist allow freedom to move, and two hand zip pockets and security zip pocket let you stash some snacks and sunscreen away safely.